In her day, the Amsterdam painter Thérèse Schwartze (1851-1918) was a celebrated portraitist who combined talent and expertise with a head for business. She produced likenesses of the Dutch elite and members of the royal family in a notably un-Dutch style, becoming a millionaire in the process. Schwartze also established an international reputation, with countless exhibitions and commissions throughout Europe and the United States. The seemingly effortless brilliance with which she turned out elegant (and sometimes flattering) likenesses of her wealthy clients earned Schwartze much success, but also harsh criticism, especially from advocates for democratization and the renewal of society and art. Even after she had become a millionaire, Schwartze continued working with undiminished energy. 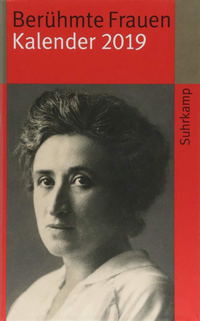 Her reasons may have been determined partly by her family’s history of immigrant entrepreneurship in the Netherlands, Germany, and the U.S. A strong will to succeed − and recognition of the very real possibility of failure or bankruptcy − were among their defining traits. This makes it easier to understand why Schwartze focused primarily on commissioned portraits, the sale and price of which were always fixed in advance. The economic and cultural passivity that gripped early 19th-century Holland was reflected in the period’s paintings. According to the historians Jan en Annie Romein,”the renewed middle class of the 19th century, with its atmosphere of domesticity and its lack of fresh air, did not give rise to any fascinating new aesthetics.” The relatively modest demand for portraits was met by the sedate, skillfully painted images produced by the likes of Cornelis Kruseman (1797-1857) or his second cousin Jan Adam Kruseman (1804-1862), or by Jan Willem Pieneman (1810-1860). These were Schwartze’s precursors. In the 1860s, however, the Netherlands entered an era of economic recovery, with a rapid expansion of trade and industry, banking, and the transport network. The country started to recover some of its faded international prestige, and the nouveaux riches sought to affirm their new status just as those with “old money” had done back in the 18th century – by commissioning more dynamic portraits. The time was ripe for an artist with Schwartze’s talents: her cosmopolitan background, combined with a flair for pictorial elegance and even ostentation, opened a new chapter in Dutch portraiture. Schwartze’s early portraits are fairly subdued. 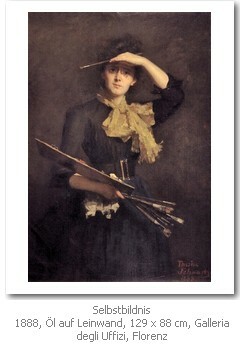 Her stylistic development can generally be described as progressing from a meticulous technique using darker colors, borrowed from German role models like Franz von Lenbach and Karl von Piloty, toward a lighter tone and more vigorous brushwork influenced by French and Dutch Impressionism. Until 1885 she worked exclusively in oils, then gravitated toward pastels, with which she began experimenting in 1881, and which further encouraged her lightening of tone. Even Schwartze’s fiercest critics have praised her pastel works for their virtuoso technique. Oddly, we do not know who taught her to use pastels, and it is just possible that she taught herself by studying the works of earlier pastelists. Her first biographer, Willem Martin, points toward several British and French masters from the 18th century, whose portraits Schwartze “must have seen hanging in numerous family homes.” She surely appreciated the fact that pastels are easy to transport and require neither a palette nor a waiting period to dry. Because she painted for a living, Schwartze had few qualms about bowing to her clients’ preferences. This obliging attitude is well illustrated by the 1916 portrait of the six Boissevain girls, illustrated here. 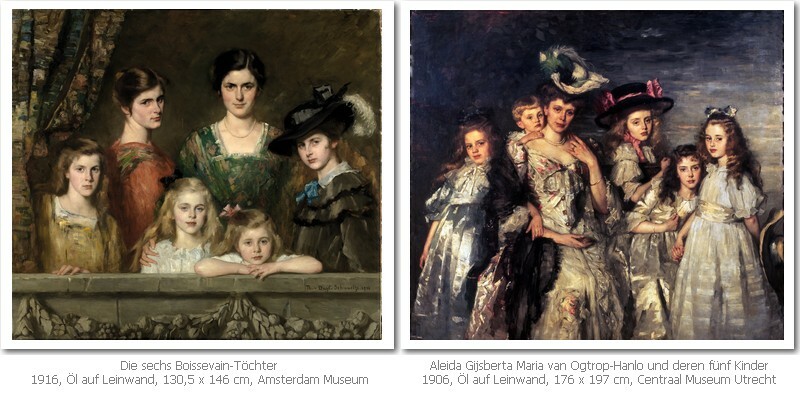 When the parents asked Schwartze to depict their daughters, they were already familiar with her 1906 portrait of Aleida Gijsberta Maria van Ogtrop-Hanlo with her five children. The latter still makes a lively, modern impression thanks to its light coloring and loose brushstrokes, as well as the almost nonchalant poses and arrangement of its figures. This approach did not suit the Boissevains, however, who asked Schwartze to produce a more classical portrait. The result thus makes a more old-fashioned impression, with its darker colors, precise draftsmanship, and conservative composition. Here Schwartze quotes several renowned precursors: Velasquez in the girl who stands furthest to the left by the curtain, and Raphael in the angelic child resting her arms on the balustrade. Clearly Schwartze knew well the precedents of such forerunners as Titian, Rubens, van Dyck, Rembrandt, and Gainsborough, and could quote them when necessary. 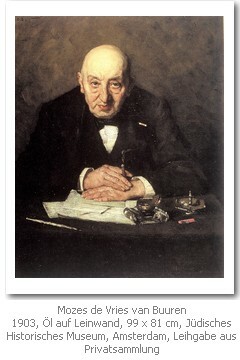 A fine example of a male sitter’s portrait is illustrated here: as director of a textile wholesaling firm, Mozes de Vries van Buuren introduced employee benefits such as health insurance and pension funds, making him a much-loved employer in the age before statutory social security provisions. His company also loomed large in the socio-cultural fabric of Amsterdam’s Jewish community: besides providing employment, it functioned as an informal marriage market. Here, as in so many of Schwartze’s commissioned portraits, the sitter gazes straight at us with confidence, enhancing our respect for him and implicitly reminding us of historical portraits of monarchs and nobles. Schwartze’s self-portraits are something completely different. In 1888 she received the signal honor of being commissioned to paint one for Florence’s Uffizi Gallery, which still exhibits its collection of international self-portraits in the Vasari Corridor that crosses the River Arno. 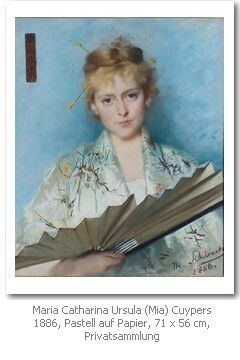 It makes sense that this canvas earned Schwartze a silver medal at the 1889 Paris world’s fair, given the meticulous planning of its composition, in which the diagonals of her palette and paintbrushes, along with the shadow created by her upraised hand, create a memorable sense of movement and contrast. 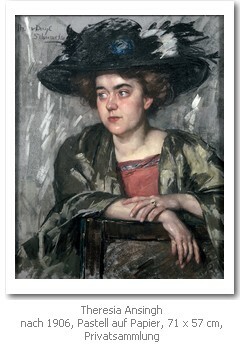 Willem Martin observed that Schwartz “had (and this is extremely clear from the portrait) a very uncomplicated nature: she was not someone who was tossed hither and thither by doubts.” Her self-portraits functioned as a kind of advertisement, which was partly why Schwartze included them in various exhibitions. She circulated engraved and lithographed reproductions of the Uffizi picture, and also commissioned photographs of herself for publication in newspapers and magazines. Schwartze’s portraits of her friends and relatives were not commissioned, and thus reveal much more variety in the sitters’ poses and the taking of artistic liberties that could not be risked with paying clients. These are seldom presented from a frontal perspective, and often the face is half hidden in shadow; they also are more likely to feature loose Impressionistic brushwork. A fine example in this regard is the portrait illustrated here of Schwartze’s niece, Theresia Ansingh, who later became a member of the Amsterdam school of female painters known as the Joffers, many of them inspired by Schwartze’s professional success. 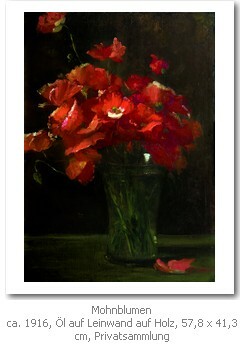 Although she worked primarily on commission, Schwartze also produced independent pieces for the trade – largely figurative paintings, but also landscapes and still lifes (especially flowers like the radiant Poppies illustrated here). 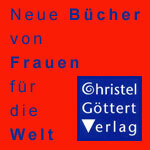 Many of Schwartze’s figurative pieces feature young girls and women. Those from higher social classes are armed with a book, mirror, guitar, or harp. Those from humbler origins often appear in traditional dress and without such attributes. Among Schwartze’s favorite sitters were girls from the Amsterdam Orphanage, who wore decorative red, white, and black uniforms, and also girls making their first communions and confirmations, where the white veils connote purity. 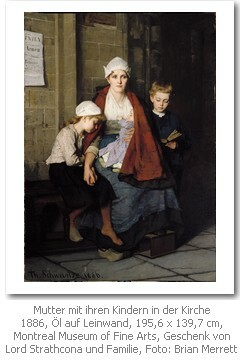 A fine example in this genre is Mother and Her Children in Church, which made its way to the Montreal Museum of Fine Arts via the prestigious collection of the Scottish-born, Canadian-based entrepreneur Lord Strathcona. Working at high speed was one of Schwartze’s defining traits. In oils, she used the “wet-in-wet” method: the sections she was working on had to be completed while the paint was still wet, within no more than three days. The fresh appearance of her most successful portraits is partly attributable to this intensive method, and indeed many portraits were completed in a matter of days. Schwartze often referred to professionally made photographs of her sitters as aides-memoires, yet she always enhanced his or her dynamism to make the image her own. Though many late 19th-century artists consulted photographs, few admitted doing so because “purists” dismissed them as a crutch. 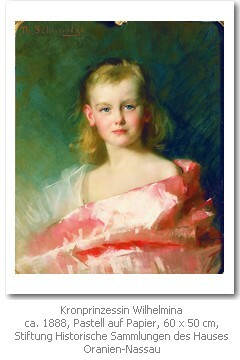 Willem Martin notes that “The initial sketch would be laid in quickly amid continuous chatter, in which the painter herself would join in, with the somewhat absent-minded attention that followed from the nature of her work, or while [someone] read from an exciting novel or even the newspaper.” Schwartze was eager to ensure her sitter was never bored, so speed and cheerfulness were deployed to help foster an animated likeness. These qualities also seem to have been integral to her character: her contemporaries describe her as witty and entertaining, though to what extent she cultivated this impression is hard to say. Schwartze’s high prices, flair for public relations, and active role in public life through various official posts elicited both admiration and resentment. She remained much in demand as the Dutch elite’s leading portraitist right up to her death in 1918, by which time—of course—World War I had changed the tenor of European art forever. Drs Cora Hollema holds a master’s degree in sociology. She works as a freelance writer and has curated numerous exhibitions, including a Schwartze show at Zeist Castle (1989-90). 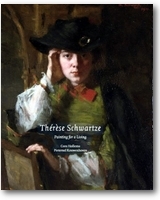 Having already published a Schwartze monograph in Dutch, she has just produced an English-language version, Thérèse Schwartze: Painting for a Living, co-authored with arthistorian Drs Pieternel Kouwenhoven. 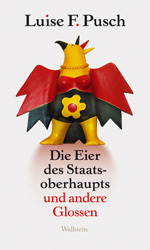 The book can be ordered via www.thereseschwartze.com. 70 $ (freeshipping).